﻿ Study the advertisements on the following pages. Select suitable jobs for which these applicants could apply. 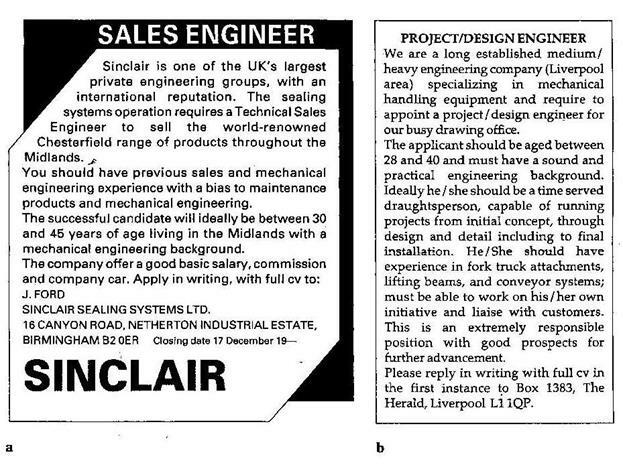 1) Technician engineer, 27, HNC1 in Electrical Engineering, with two years’ sales experience. 2) Professional engineer, 35, with five years’ experience in the automotive industry. 3) Design engineer, 42, BSc in Mechanical Engineering, with experience in managing projects. 4) Technician, 24, National Certificate in Mechanical Engineering, two years’ shop floor experience. 5) Electrical engineer, 50, HNC, long experience in maintenance of high voltage plant. 6) Mechanical engineer, 46, HND, experience in maintenance. Part of the N & S Group, one of the world’s major suppliers of automotive components, PREMIER VANDERBILT LDT is a market leader in the manufacture of plain bearings for automotive and general engineering applications. 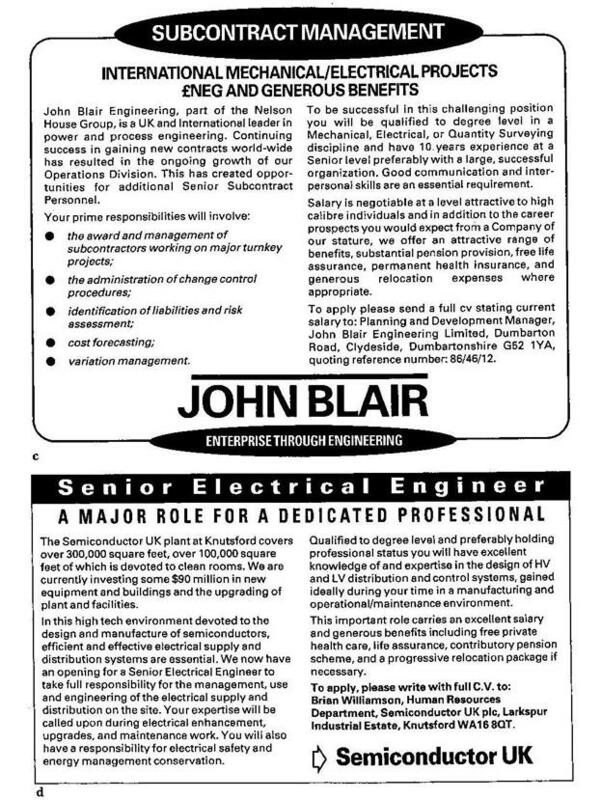 QUALITY ENGINEER – c. ₤ 16 k Our manufacturing facility at Wycliffe Valley, Bathfgate, commenced production in early 1992 and the workforce has expanded rapidly. We now require a Quality Engineer to join us. Reporting to the Quality Assurance Manager, you will be responsible for ensuring quality related activities are implement in line with company policies and objectives. Educated to at least HNC level in mechanical engineering, experience in quality improvement in advantage. A working knowledge of SPC, FMEA, DOE, and problem solving techniques is essential. Together with an attractive salary the benefits are those which can be expected from a progressive organization. There will be excellent opportunities for career development as the company continues to grow. To apply, please send a cv stating current salary, to, Stuart P. Alexander, Human Resources Manager, Premier Vanderbilt Ltd, 10 Stonehouse Road, Wycliffe Valley Industrial Estate, Bathgate, Berks RG20 2EW. Closing date for applications in Wednesday 5 January 19- and interviews will be held during January 19-. I: Why do you want this job? CK: I like traveling and using my languages. I also like meeting people, and I want a new challenge. I really want to work for this company. It has an excellent reputation. I think with my excellent sales experience I can contribute to its success. I: What are your strengths? CK: I am fluent in Italian and Spanish. I am good at training sales staff and I get on well with people. I think, I’m very good at organizing seminars for customers. I: What mistakes have you made? CK: I’m not patient when people don’t meet deadlines. I: What kind of people do you work well with? CK: I like people who work hard and are reliable. I: What are your interests? CK: I have a lot different interests. As I said before, I like traveling, and I like reading travel books. I also like aerobics and skiing. I: Do you have any questions to ask us? CK: If I get the job, when would you like me to start? Charlie: My worst interview experience was about three years ago. I had a group interview for a sales rep. job with a big media company. I was fine at first but when the interviewer asked me a question I suddenly began to feel very nervous. My throat went dry and I couldn’t speak. They offered me a jug of water and a cup. All 20 people in the room stopped and looked at me. I tried to pour water into the cup but my hand was shaking so much that the water went everywhere. I was so embarrassed I had to leave the room. I still go cold all over when I think about it. Alison: Well, I think my worst experience was about two months ago. I had an interview for a job that I really wanted. I decided to drive but I got stuck in traffic and when I got there I was in a big hurry. By mistake, I parked my old car in the Managing Director’s parking place. He arrived as I was getting out of my car. He hooted his horn and asked me to park somewhere else. I ignored him and ran off to the interview. Unfortunately, he was the interviewer and he was so angry that he didn’t even give me an interview. Kevin: My first interview after leaving college was for a trainee accountant job in a firm in Leicester. When I walked into the room the interviewer threw an ashtray at me. I quickly moved to one side and it missed. Unfortunately, I didn’t get the job. They told me afterwards that the ashtray was to test how people react. The person who caught the ashtray and threw it back got the job! The people who moved to one side or caught it and put it back on the desk, didn’t! 1. Агабекян И.П. Английский язык для технических ВУЗов: – М.: Изд-во Высшее обазование, 2005. 2. Агабекян И.П. Английский язык для менеджеров – М.: ТК Велби, Изд-во Проспект, 2008. 3. Бгашев В.Н. Английский язык для машиностроительных специальностей ВУЗов: – М.; Астрель: АСТ, 2002. 4. Ваштаева Л.И. Рыжова Е.А. Методическое пособие для студентов факультета энергетики: Н-ск: НГТУ. 5. Голицынский Ю. Грамматика. Сборник упражнений. С.-П. : Изд-во Каро, 2006. 6. Дюканова Н.М. Английский язык. Деловые контакты. Учеб. Пособие. – М.: Иностранный язык, Изд-во Оникс, 2008. 7. Зыкова Г.Н., Кочетова А.А. Английский язык для студентов гуманитарных факультетов и факультетов иностранных языков. – М.: Астрель: АСТ, 2008. 8. Орловская И.В. Самсонова Л.С. Учебник англ. Языка для технических университетов и вузов. – Москва. : Изд-во МГТУ им. Н.Э. Баумана, 2001. 9. Полякова Т.Ю., Синявская Е.В. Английский язык для инженеров. – М. : Изд-во Высш. шк., 2002. 11. Evans Virginia, Dooley Jenny. Enterprise. Coursebook. Elementary. – Express Publishing, 1999. 12. Glendening Eric H., Glendening Norman. Oxford English for Electrical and Mechanical Engineering. – Oxford University Press, 2001. 13. Hollett Vicki, Sydes John. Tech Talk. – Oxford University Press, 2005. 14. Keith Boeckner, P. Charles Brown. Oxford English for Computing. – Oxford Universities Press, 2001. A. Excuse me, could you tell me the way to the Museum of Arms?